I had thought when my lactofermentation workshop was over that I would be done with the pickling posts for a while. I had thought that I might take a break, work on some other recipes, and give those of you out there who are neither attached to soured foods nor fascinated by edible bacterial processes a turn with some entrees, or desserts, or even some fresh, unfermented vegetable snacks. And then one thing led to another, and things took a turn. But it turns out, dear readers, that it’s kind of a good thing that they did. Because as I was slicing up brassicae and boiling up brine, it occurred to me that there is a key element missing from all the pickling posting I’ve done over the past little while: my lacto-pickles are scattered over more than a year’s worth of general-purpose blogging; even for me, they are desperately hard to find; and for my sanity and yours, they could really use an index. That’s what this post is: a central clearinghouse, a one-stop shop for all your pickling needs. Below, I have listed all of the lactofermented vegetable recipes that I’ve done on the blog. And the plan is that as I post new ones — as I break my no-more-pickles rule repeatedly and inevitably — I will update this post to keep things sorted. Sarah, with sneering disdain, calls this meta-blogging. But I call it eminently practical. So bookmark this post for future reference, and come on back from time to time. It’s the most systematic guide you’ll find to anything here at Twice Cooked — except, of course, for shortcrust pastry. Lacto-Fermented Pickles. Posted October 1, 2012. I am, I will admit, yet a wild-fermentation neophyte. My experience making beers and meads has given me a good sense of how to proceed, and Katz’s book has filled in many of the gaps. But while I am providing a recipe here, please do recognize that it is provisional. Spicy Fermented Greens. Posted October 7, 2012. All this fermentation business seems to be going to my head. It used to be, when I would triage our incoming CSA bundle, I would think to myself: What gets eaten raw? What am I going to cook? And what scraps are going to end up in the compost? 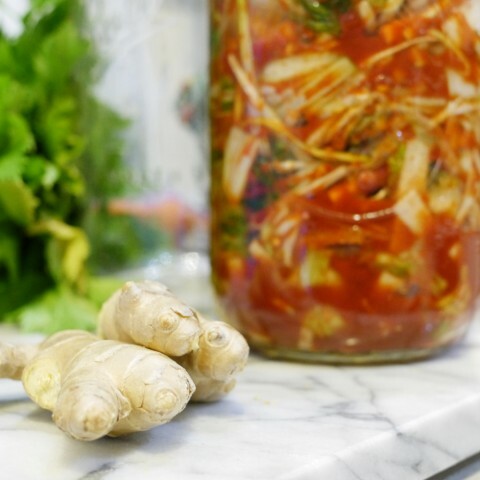 Now, I think: What can I ferment? Lactofermented Radishes. Posted December 28, 2012. Are pickled radishes going to be the same as the jar of Vlasic bread-and-butter slices sitting in your fridge? No. And that’s a good thing. They have a mild sweet-spicy flavor, a faint hint of cabbaginess, and like I said, they do a great job of picking up the flavors of whatever spices you add to the jar. Which means that if you want garlicky? Great! If you want hot? Lovely! If you want sweet like a Chinese pickled turnip? All the better! Lactofermented Mixed Kraut. Posted June 17, 2013. Like every other sauerkraut out there, this one is a lactofermented pickle, which means that it derives its acidic kick from bacteria that blanket almost every surface on the planet, that gobble up sugars and squirt out lactic acid as waste. Like every other sauerkraut, the point of this one is to preserve leafy vegetables — to control their decomposition such that they remain viable for a really long time, and such that they gain, rather than lose, nutritional value. And most importantly, like every other sauerkraut, this one is delicious and takes all of fifteen minutes to throw together. Herby Lactofermented Daikons. Posted August 24, 2013. Pickled daikons in whatever their form are deliciously distinct — at once less sweet, hot, and cabbagy than their pinker, rounder, European cousins. 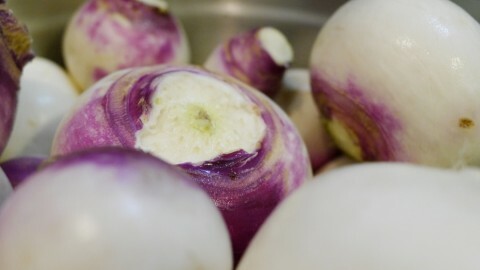 They start off with that familiar radish spiciness, but by the end of their first week of fermentation, it has largely cleared out in favor of a pleasantly eye-opening sour that I’ve found makes a great pick-me-up as an accompaniment to breakfast. Mak Kimchi. Posted September 1, 2013. 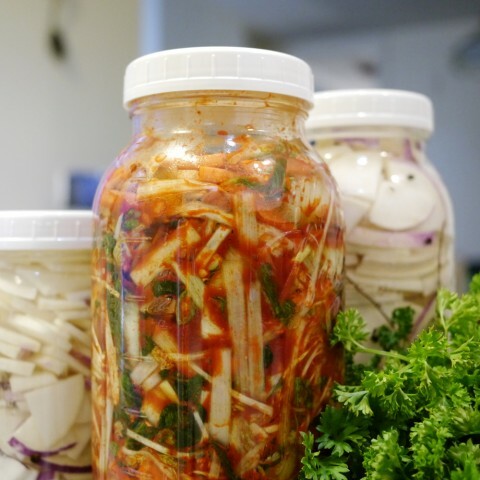 But it turns out that kimchi is much more than just pickled cabbage — that depending on the season, kimchi can come fermented or fresh, and be made from an array of vegetables (and fruits) including cucumber, radish, kale, squash, persimmon, pear, and dates. 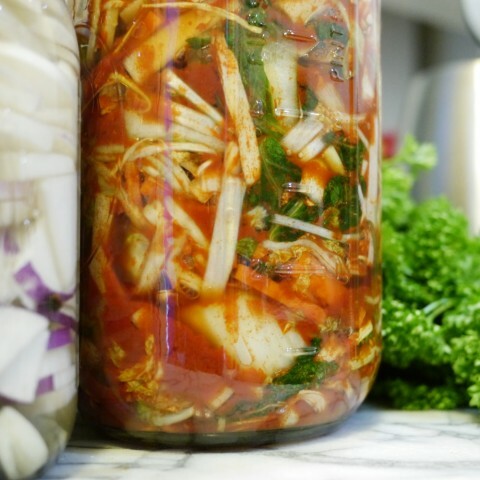 And it turns out that kimchi is much more than one set of techniques — that depending on region, family, and individual preference, it can be made spicy or mild, white or red, with or without carrots, onions, rice porridge, and even raw seafood. Fermented Red Hot Pepper Sauce. Posted September 25, 2013. The thing with túóng ót toi, at least according to all the recipes that I could find, is that it’s usually a vinegar-based quick pickle. … But not so with my red hot pepper sauce. Here, I’ve jettisoned the vinegar entirely in favor of a fermentation-based sour. I’ve retained the sugar. But instead of simply sweetening the concoction, it offers a nice house-warming gift of nutrition to all those yeasts and bacteria that make this recipe distinct.